Wentworth Park’s heritage listed Tower on Wentworth Park Road was last night bathed in red light, in support of Cystic Fibrosis’ 65 Red Roses campaign throughout the month of May. The iconic tower, which will be red until Friday night, drew plenty of attention from passing traffic, with Wentworth Park conducting its 65 Red Dogs meeting this Friday night. 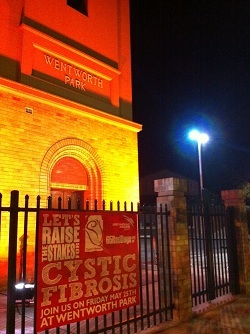 As the 65 Red Dogs Raise the Stakes for Cystic Fibrosis campaign draws to an end, Wentworth Park will undertake a number of fundraising efforts on Friday night to add to the NSW tally which already stands at over $24,000. The Greyhound Racing NSW and Cystic Fibrosis partnership has seen each red rug winner at selected NSW meetings contribute $250 towards the cause, with tracks undertaking other fundraising efforts to add to the final tally. NSW GBOTA Executive Officer, Brenton Scott said that with over 3,200 Australians living with Cystic Fibrosis being able to assist with the funding for research was important to the Association. “Thanks to advancements the average life expectancy of someone living with CF is now mid thirties, but there are still many children who do not reach adulthood … research must continue,” Scott said. 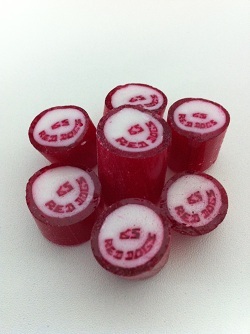 Attendees on Friday night will be able to purchase a red balloon or custom event made Rock Candy to support the cause, with Wentworth Park hoping to raise an additional $1,000 on the night. Further information can be obtained from NSW GBOTA on 02 8587 1210 .